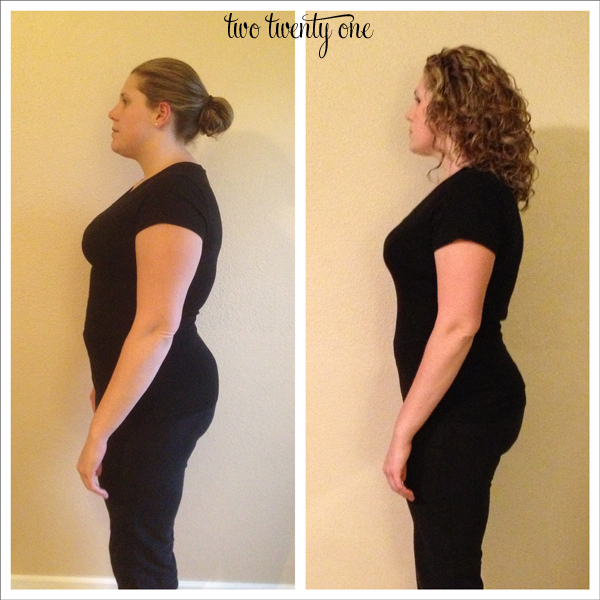 In case you missed it, a couple weeks ago I shared how I lost 20 pounds in 2.5 month. At the end of the post I asked if anyone would be interested in doing a Whole30 challenge on Instagram. Apparently quite a few of you are interested, so let’s do this thing. We’re going to start on Monday, September 9th. I know that seems like a long time from now, but I wanted to make sure people had enough time to get the book, It Starts With Food, and read it. I also don’t want to start before Labor Day and have people tortured at cookouts. And I don’t want to start in the middle of the week. If we start on a Monday it should give you the weekend to shop for food and meal plan for the week (here’s the printable Whole30 shopping list). Now, this isn’t really a challenge. No one will win a prize or money for losing the most weight or feeling the best. This is for us to support one another and share meals & recipes via Instagram. This also isn’t going to be super formal either. I’m no one’s mother so I’m not going to be keeping tabs on people. Ain’t nobody got time for that. So if you fall out of the challenge and go silent on Instagram (which I hope you don’t), I’m not going to hunt you down, slap the cookie out of your hand, and force feed you organic, grass-fed beef and a sweet potato. 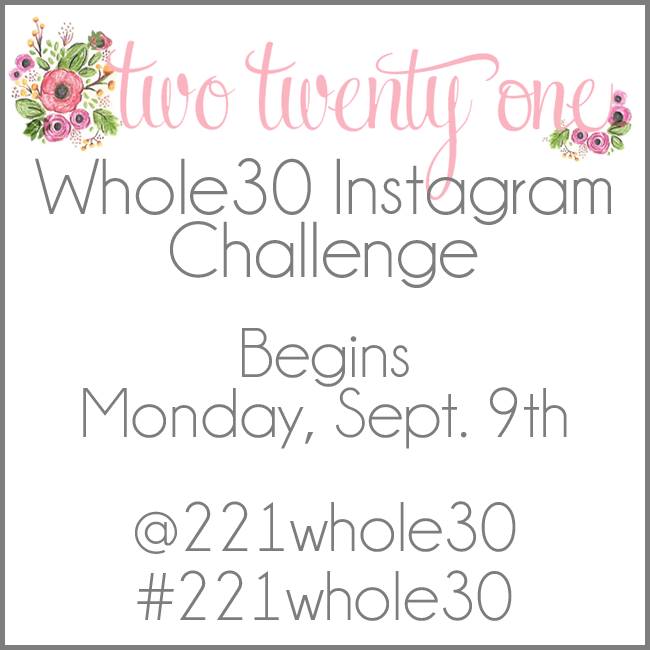 I created a special Whole30 Instagram account, aside from my regular twotwentyone account, so follow me at 221whole30. The hashtag we’ll use is #221whole30. Include that hashtag with all of your Whole30 related posts so everyone who’s participating can see your photos when they click on the hashtag. I highly recommend getting your starting weight and measurements (at least bust, waist, hips) and taking ‘before’ pictures (front, back, left side, right side). Though I wasn’t excited about it when I took my ‘before’ pictures, I’m happy that I did because I’m able to see the difference now. Also, keep in mind that I’m not a Whole30 expert. I merely did the program and had great results. Consult the book or Whole9 website for specific information. I hope you’ll join us for the challenge! It’s only 30 days. And I don’t know about you, but months are flying by for me this year so the 30 days will be up before you know it. Now go set up an Instagram account, if you don’t already have one, and follow me at 221whole30. Yay! I’m so relieved that you decided to start it the week AFTER we get back from vacay 🙂 I talked it over w/my hubs, and we’re going to do it together. I’ve heard great things about this from friends, so I’m excited to try it and have a support group! The start date is perfect since I leave for vacation Sunday! I’m excited to go on this journey with you and several other interweb friends 🙂 I’ve got the book and plan on reading it in the car on my way to Minnesota. Can’t wait! So excited to feel the health benefits!! Hmmm…. I should probably do this, right? It’s going to be hell trying this while living with my in-laws though!!!! OK, I’m in. Ordering the book now! I’ve struggled with my weight… well forever. As badly as I want to shed the pounds, my major issue is that I have zero motivation. It’s so frustrating! I figured it wouldn’t hurt to try this challenge with everyone, right? I also live with my mother-in-law and that’s also a concern of mine. Sometimes it just not as easy as living on your own and having total control over the food that comes in the house. Awesome! So gonna do this with y’all! I need to lose some baby (ahem, OK, she’s almost 2 now!) weight ASAP! Can’t wait. And thanks for the shopping list PDF! This is such a fun idea! I’m totally in. I know I won’t be 100 percent at all moments, but it will be great motivation. thanks for doing this! PS. Just got the book yesterday.